Congratulations to the Rays. Scoring 3 runs in the bottom of the 8th to win the Centre Sluggers Championship 4-2 over the Tigers. 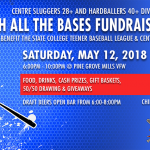 Have lunch or dinner at the Texas Roadhouse and support the Centre Sluggers and Hard Ballers Baseball Leagues. Print out the flyer and bring it with you to the restaurant. 10% of your bill will be donated to our League.